Popeye the Sailor Man told kids to eat their spinach in order to grow strong, and caused a 33% increase in spinach consumption during the Great Depression! While eating spinach may not give you bulging biceps like Popeye’s, spinach is loaded with nutrients like Vitamin A, C, K, folate and antioxidants. 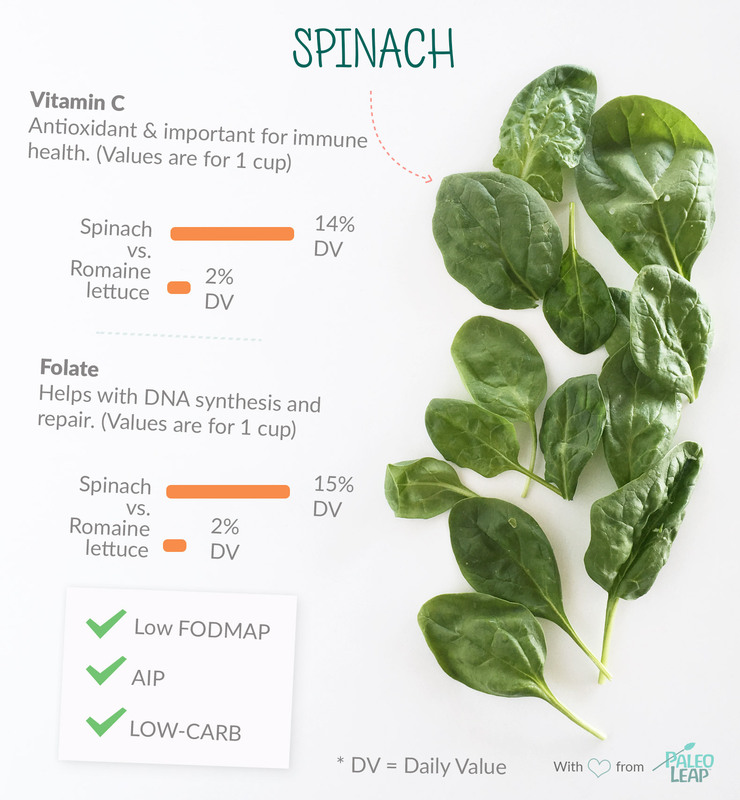 Spinach is often promoted as being rich in Vitamin A. However, the vegetable form of Vitamin A is comprised mostly of beta-carotene. The conversion of beta-carotene to the usable form of vitamin A — retinol — is quite poor. Consuming animal forms of Vitamin A (like liver and eggs) will provide retinol and is the more efficient method to consume Vitamin A. Similar to Vitamin A, the form of Vitamin K found in spinach is called K1. Vitamin K2 is found in animal sources (liver, grass-fed dairy and meat, poultry). However, daily value percentages for Vitamin K1 and K2 are often lumped together, so remember we need Vitamin K from both plants and animals. Enjoy spinach tossed into a salad, sauteed in a breakfast scramble or mixed in with a creamy dip! Orange dots show how 1 cup of spinach fits into the typical nutrient profile of a Paleo meal. SELECT: Look for spinach with a deep green color in the leaves and stems. If spinach is slimy or smells bad, toss it! STORE: To maintain freshness, keep spinach in the vegetable drawer in the refrigerator. Wait until you’re ready to use it to wash it. SEASON: Spinach can be found year around, however spring and early fall are when spinach is most fresh. Serve poached eggs over sauteed spinach and mushrooms. Use spinach to create a creamy dip with a base of mayonnaise, coconut milk, or processed cashews. Add spinach to a stuffed vegetable dish, like stuffed mushrooms or stuffed bell peppers. Swap out basil for spinach in a dairy-free pesto.